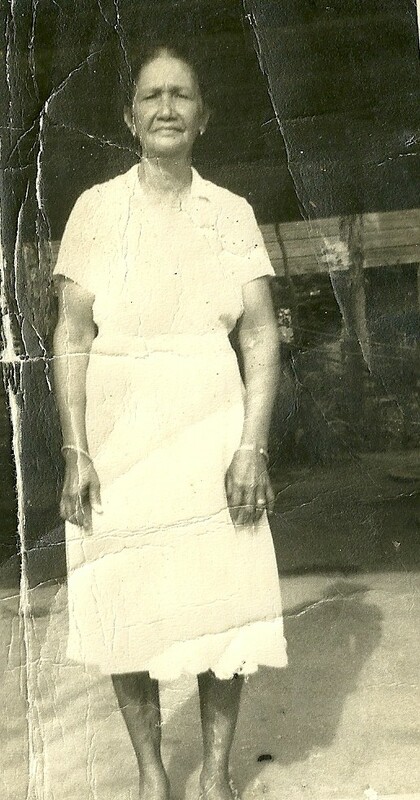 "This is Ellen Vyphuis, my beloved grandmother. She never met a flour sack or just about any article she couldn't recycle." Marilyn Ng-A-Qui (pronounced neeg-a-key) is a crafter at heart. Forthright and outspoken, she derives great personal satisfaction from sewing -- it has remained a constant thread from her childhood to her adult life. Growing up in Guyana, to have clothes she liked, Marilyn had to either have a dressmaker or make her own. So as a little girl she learned from both her grandmother and her mother how to sew and how to cut and manipulate fabric without patterns. 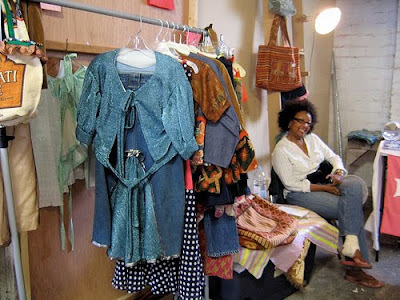 In fact her shop, Vyphuis Designs, is named for her maternal grandmother, Ellen Vyphuis, the quintessential DIYer. Utilizing the bright and lively colors of her Caribbean background, Marilyn creates clothing and home furnishings that appeal to a broad spectrum of clients. 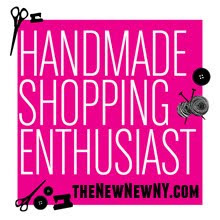 Whether making sturdy yet whimsical children clothing, adult sportswear, or vibrantly colored items for the home, Marilyn says what sustains her day in and day out is the positive feedback she receives from friends and customers alike. One can see the vivid influence of her African, Indian and Chinese heritage, and the lushness of her home surroundings, in her designs. Intense color, heavy rainfall, incredible flowers and animals were all part of her world growing up and, though she now lives and works in Brooklyn, continue to be important elements in her creations. Serious illness, and the hostility this country has for young black men. I have two sons. I don't identify with any one historical figure but with all the women of color who helped raise this country to what it is today. Those men and women who leave their countries of birth and all things familiar, to take their chances in this country even though it is not always so welcoming to people who are different in color or creed. Buying fabrics is my greatest extravagance. I'm seduced by color, texture, and content. I have more fabric than I could ever use, stored all over my house. I'm happiest cutting fabric, sewing, and ending up with something unique. I wish I had better time management. Among the accomplishments for which I'm most proud is the raising of my oldest son and the adoption and raising of my two younger children. I think I would like to be reincarnated as myself. Hopefully, I've learned a few things in this life that I can use in the next because while life has not been easy, I've been incredibly blessed. I know the circumstances from whence I come and where I am today, and its been challenging and amazing. My most prized possessions are my creativity and the gold jewelery that have come with me from my country of birth. I would like to learn pottery and become proficient at online marketing. Hanan Ashrawi is someone I've admired for many years, for her recognition of the common needs of all people, and for her work to bring peace to the Palestinian people and to Israel. She is bold in speaking out against the injustice of the occupation and the oppression of her people, but she is also pragmatic about the need for peaceful co-existence. I abhor waste. I remember sitting beside my grandfather while he removed nails from old structures and straightened them for use in new construction. I have many other memories of us creating, recycling and transforming to meet new needs. See (and shop!) 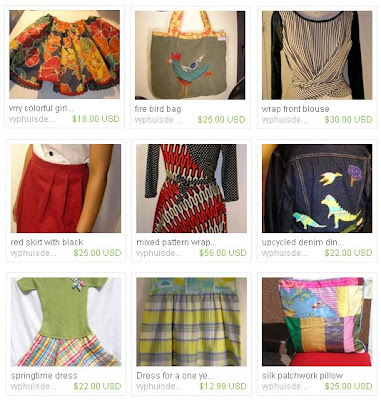 Marilyn's colorful clothing in her Etsy store at VyphuisDesigns.